Although it has been a common dream of many since childhood, not many of us get the opportunity to find buried treasure. But the school children and volunteers of the new interactive Sanhedrin Trail did just that. The new walking path called the Sanhedrin Trail is 70 kilometers (43 miles) long. According to archaeologist Yair Amitzur, who has walked the entire trail, it takes an average of 5 days to hike. He’s hoping to add camping sites along the trail so that tourists don’t have to sleep in the rough as he did. But this isn’t just any walking trail. The trail is “connected,” meaning it uses technology to teach you along the way by sending information to your smartphone as you hit certain milestones. Tourists will be able to learn all about the archaeology, nature, and historical surroundings — plus all three major monotheistic religions are represented. The technology involves using GPS through “smart stones,” which will soon be able to transmit augmented reality and 3D visuals at each site. The trail came together through the hard work of students and volunteers, which resulted in a few amazing discoveries. One group of students uncovered a 1,400-year-old oil lamp that was engraved with an eight-armed menorah, a chunk of glass, and a rare gold coin. 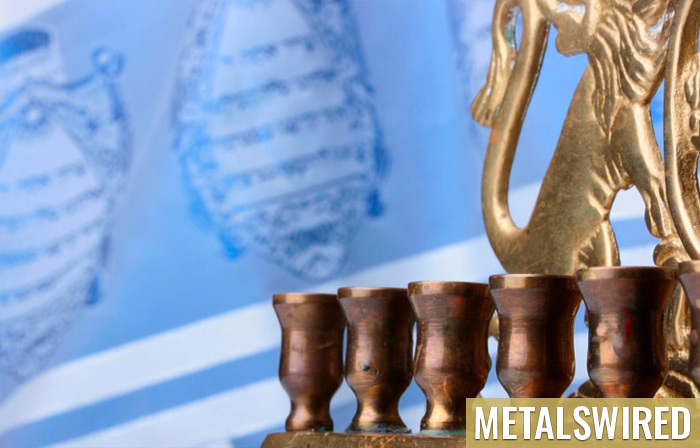 The menorah, used as a symbol of the state of Israel, only has seven staffs. The eight-armed menorah found on the lamp is used during Hanukkah. The chunk of glass found is evidence of the glass industry in Usha, which was one of the most important centers of glass manufacturing during the Roman Empire. The gold coin is from the period of Sultan Suleiman the Magnificent, ruler of the Ottoman Empire and builder of Jerusalem’s city walls, and only two others exist in the State Treasury. Continue browsing our website to read more about amazing gold discoveries.